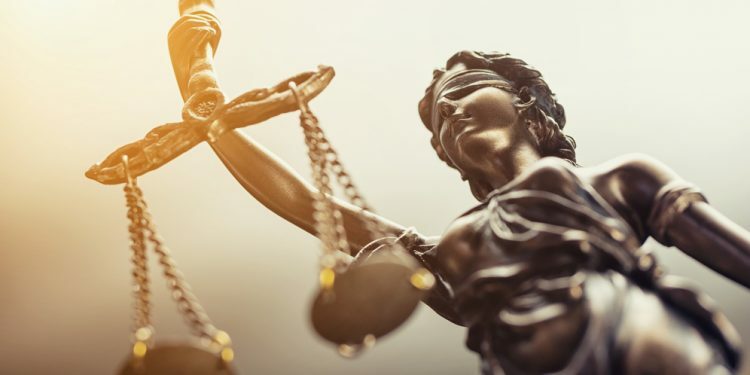 A right to free legal representation in eviction cases — combined with other important tenant protection measures — is significantly rebalancing the scales of justice in New York City Housing Court and helping keep low-income residents in their homes. That’s the clear message of the first full year’s results of the pioneering “right to counsel” in Housing Court law that was enacted in 2017 — results that have important implications for the law’s continued phase-in, and possible broadening, going forward. Historically, tenants facing eviction have usually arrived at Housing Court without legal representation, putting them at a major disadvantage to landlords who almost always have attorneys. Years of advocacy and action led New York to become the first city to adopt a right to counsel law in eviction cases. Also called Local Law 136, it gives tenants facing eviction who have household incomes below 200 percent of the federal poverty level access to attorneys, at no cost to them. The City’s Fiscal Year (FY) 2018 budget included $15 million for the first phase of the law, aimed at high-impact parts of the city; it is now reaching 20 of the city’s 200+ zip codes. The law’s geographic reach is set to expand year by year until it covers the entire city by 2022, taking in some 784,000 households. The City has also launched other anti-harassment/anti-displacement legal services programs since 2014, like the Tenant Harassment Assistance program. The major difference is that in right to counsel (“RTC”) zip codes, access to an attorney is a right for any low-income tenant facing an eviction. In non-RTC zip codes, legal services are a benefit for some low-income tenants. 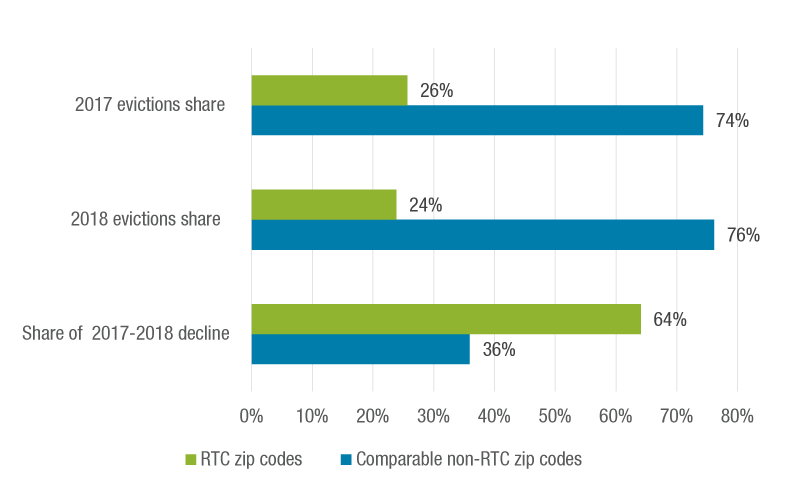 The phase-in of the RTC law thus provides a natural experiment; it’s an opportunity to compare RTC zip codes with similar zip codes that are still outside the law’s coverage. Source: Office of Civil Justice 2016 and 2018 reports; DOI eviction data. In recent years, representation in Housing Court has increased citywide. In FY 2013, only one percent of tenants had attorneys in eviction cases; in the last quarter of FY 2018, 30 percent did. 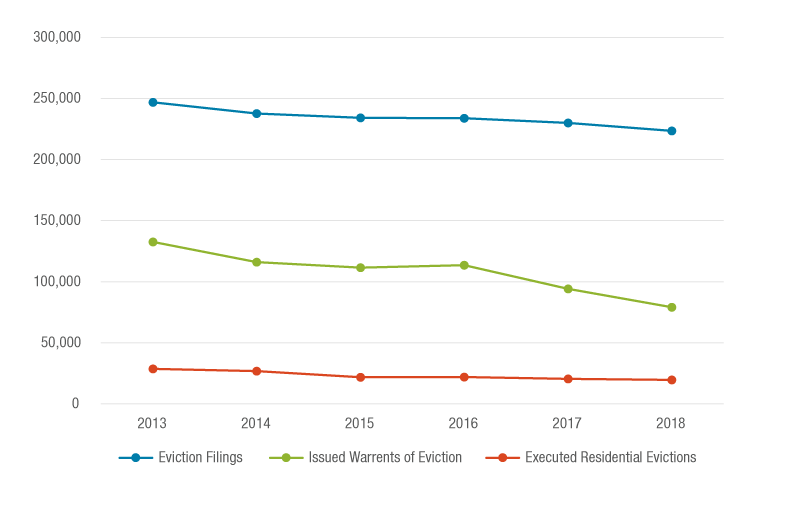 Over those years, there has been a noticeable reduction in eviction filings , eviction warrants, and executed evictions (see Figure 1). This likely results from a confluence of factors, including tenant organizing and new anti-harassment and anti-displacement programs by State and City agencies, as well as expanded legal services for tenants. The impact of these efforts, however, is greatly amplified by the right to counsel. CSS analysis shows that tenants were three times more likely to receive legal services in RTC zip codes than in non-RTC zip codes with comparable rates of poverty, evictions, and rental units. From FYs 2017 to 2018, evictions declined by 11 percent in RTC zip codes, but only by two percent in non-RTC zip codes (see Figure 2). Source: DOI data. Analysis included 20 RTC zip codes and 80 comparable non-RTC zip codes. Put in other words: With Local Law 136 in effect for just over a year, evictions declined more than five times faster in RTC zip codes than in similar non-RTC zip codes. RTC zip codes accounted for 26 percent of total evictions in FY 2017 (see Figure 3). However, a whopping 64 percent of the citywide decline in evictions between FYs 2017 and 2018 can be attributed to RTC zip codes. Analysis of RTC data by the City Office of Civil Justice (OCJ), which oversees the RTC program, shows even more dramatic results: During the last quarter of FY 2018, 56 percent of tenants facing evictions in RTC zip codes had attorneys. Perhaps most hearteningly, of the approximately 22,000 New Yorkers represented by OCJ-funded attorneys in FY 2018, 84 percent were able to remain in their homes. These preliminary but strongly persuasive successes provide support for a drive to broaden Local Law 136’s impact. The original law’s two principal sponsors, Council members Vanessa Gibson and Mark Levine, are seeking to expand the kinds of cases for which tenants can receive legal representation, and include City funding for tenant education and organizing as well as legal defense as part of the RTC law. The new bill they’ve introduced would also extend right to counsel coverage to households with incomes up to 400 percent of the federal poverty level. At CSS, we think that raising this income ceiling is crucial. CSS research focuses on the “unheard third” of low- and moderate-income New Yorkers. Based on that, we know that there are roughly 527,000 tenant households with incomes at 200-400 percent of the federal poverty level. Most live in housing that isn’t rent-regulated or publicly subsidized. Most have adult household members holding jobs in areas ranging from health care and education to retailing and food service. Far too many also regularly experience housing instability and are vulnerable to eviction. For these hard-working New Yorkers, a right to counsel would rebalance the scales of justice and reinforce security in their lives. Oksana Mironova is a Housing Policy Analyst at the Community Service Society. This article was originally published by Urban Matters.